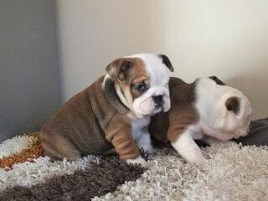 Hello every one, we have English bulldogs and Puppies available. Visit available puppies for a friendship or to have a new baby in your home today. Step 1: Make sure an English bulldog is the right breed for you and your family. Hundreds of English bulldogs are abandoned every year. Families buy them because they are popular and cute, but then they realize the dog requires too much work. 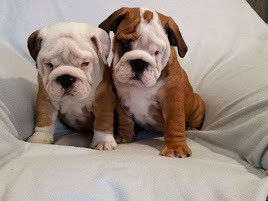 Buyers are intrigued by their charm, only to discover later all the special attention and care that may come with their wrinkles, eyes, flat faces, tail, unusual structure, irregular energy levels, and genetic defects resulting from irresponsible breeding. Bulldogs never really grow up. A normal dog matrues at 12 or 18 months, while bulldogs don't mature until 36 months (3 years). Also, their life expectancy is only 7-10 years, while other dogs live to be in their 20s. The life in their years will be exciting and fulfilling, though it may not be as long as that of a lab. Step 2: Choose a breeder. A reliable, small-scale breeder is a better choice. One who breeds one or two different dogs at a time with a maximum of one litter every two years is best. They have more time to concentrate on taking care of your puppy and not just consumed with making money. Bulldogs are usually artificially inseminated because of their awkward body strucutures. They also deliver by cesarean section because the pup's head is often too large for the mother to deliver. Lastly, bulldogs have small litters; five pups is a large number. For all these reasons, a fair price is $1,500-$3,000 dollars. 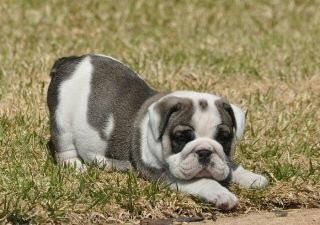 Step 3: Picking out your English bulldog dog puppy. The breeder should not let you take the dog until they reach seven weeks at the earliest. The breeder should ask you questions about your lifestyle and family to show they honestly care about they dog's well-being. Make sure you get their contact information for future advice and support. Then, go with your instinct! If you like the feisty one bugging all the others that has an attitude, go with it. If the chubby one cuddled in the corner sleeping all day is a better fit, take him or her home to share your bed. It's your decision. There is also a stigma attached to the litter's runt. I have found the runt to have the most personality and live just as long as his brothers and sisters.